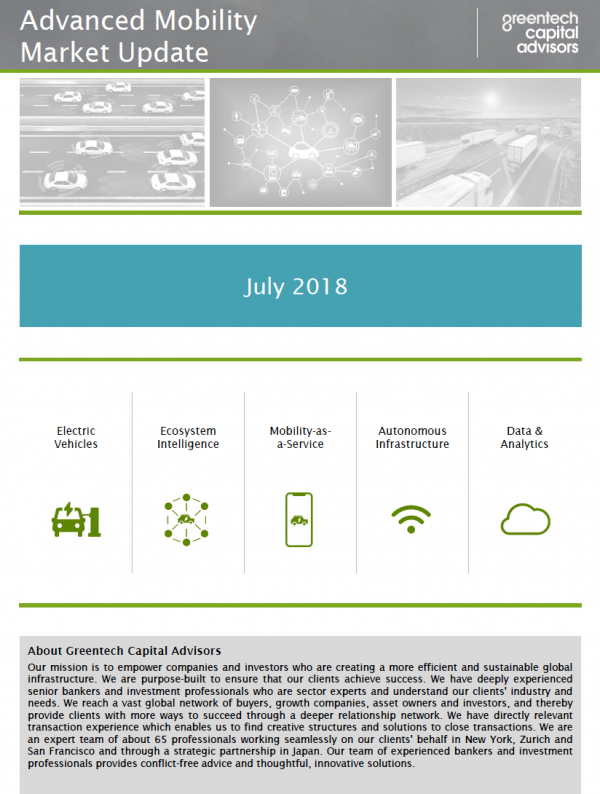 Greentech Capital Advisors’ Advanced Mobility Monthly Market Update summarizes key announcements, M&A, and capital raising activity related to advanced transportation, while providing detailed trading metrics on public companies across the sector. Zoox, a developer of automomous vehicles, closed a $500 million raise at a $3.2 billion valuation from GrokVentures and Primavera Capital. This displays the significant capital required to develop and build an AV mobility solutions business from scratch. Waymo partnered with Walmart, DDR Corp., Autonation and Avis to expand autonomous driving vehicles services in Metro Phoenix. Waymo’s partnership signals another considerable step towards launching an autonomous ride hailing service business.